I’m writing this chicken soup recipe from bed. 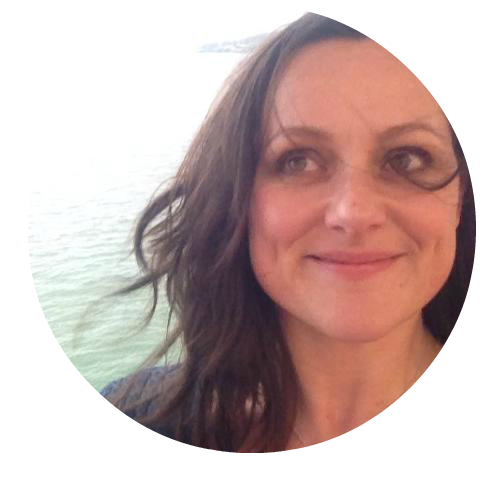 Earlier this week I was clobbered on the head with what-I-thought-was-a-cold but which I’m realising, as I reach the third day of feeling like death, is possibly The F Word. 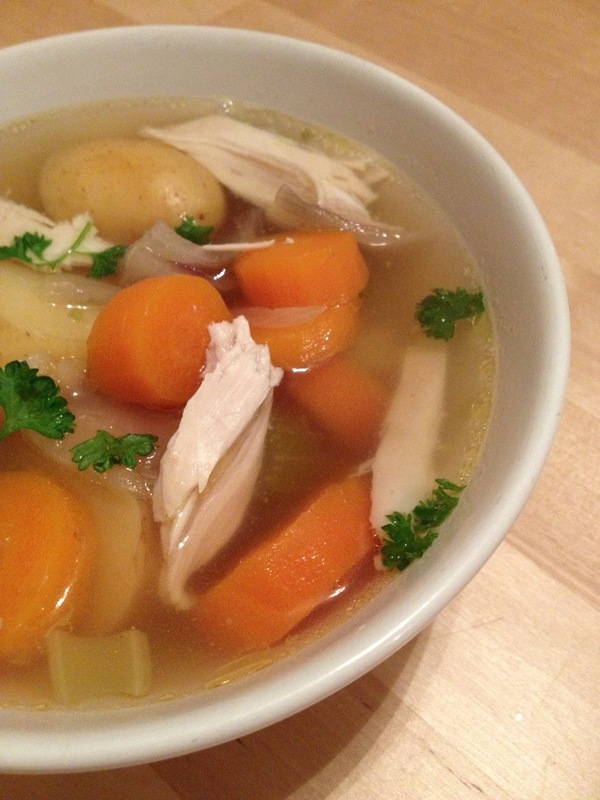 Apparently the secret to boosting your immune system is chicken soup (it’s not just a myth). So, I made up a recipe full of things that are supposed to make your immune system better. It’s super-easy (because I made it whilst feeling utterly dreadful) and the ingredients need hardly any preparation (see above). Plonk the whole chicken in the stock pot with a good sprinkling of salt and black pepper, 3 tsp of the Marigold stock, and then cover with water. Being it to the boil and fast boil it for ten minutes. Meanwhile, squeeze the *lemon and drink it with some honey and hot water. Listen to Radio 4 and mope a bit. 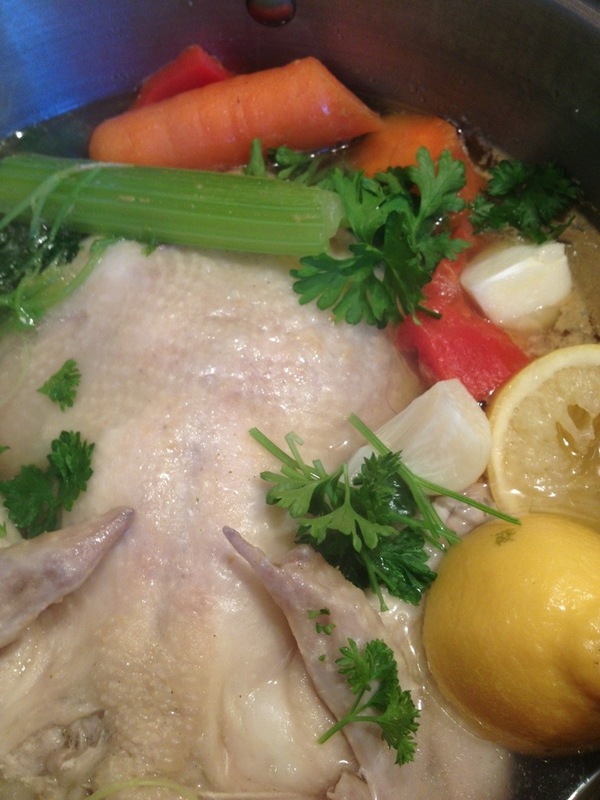 Bring the chicken down to a simmer and skim off any foam that has formed and bin it. Add the garlic (all of it) and the lemon skins, a couple of the celery sticks (just broken in half will do and you can add the frondy bits, too, to add more flavour) and a decent sized chunk or two of the chilli (all the above are immune boosters and help fight off horrible colds and things) and a big handful of parsley, stalks and all. Simmer the chicken for an hour and a half or so until it’s cooked. Meanwhile, prepare the other veg. 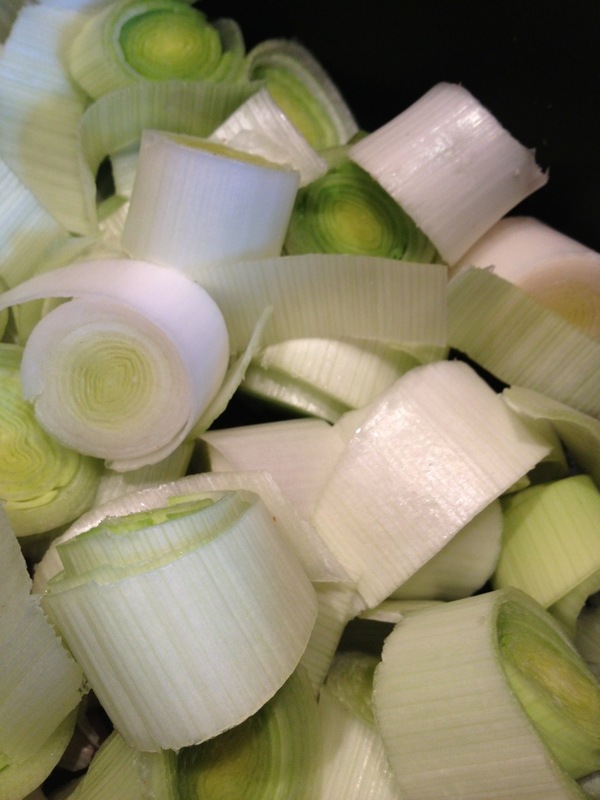 With everything chopped and ready, you’ve done the hard bit. Hoick out the chicken, giving it a second to drip or there’ll be mess everywhere and when you’re feeling grim, that’s the last thing you need. Skin off (the chicken, not you) and remove all the meat. Put the bones back into the stock and simmer for another two hours, or more. Once the chicken meat is cool, stick it in the fridge for later. Try not to eat it all (it’s gorgeously plump and yum, mind you). Once you’ve let it simmer, strain the stock through a colander and into another big pot with the veg. Purists would say you need to sweat them off in butter first, but I didn’t and it still tastes lovely. 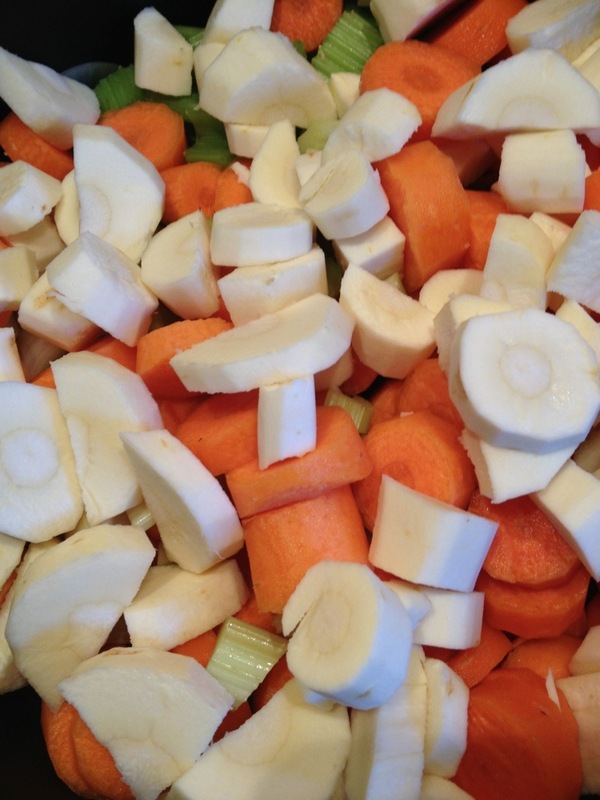 Cook on a medium heat for as long as it takes for the veg to be tender – 20/25 minutes should do it. Add the cooked chicken pieces after ten minutes. Sprinkle with some more chopped fresh parsley (it’s really good for the immune system) and serve with a warm blanket and something comforting on the radio. If you’ve got fussy children who don’t like lumps of stuff in their soup, you can whizz this and even my fussiest child loves it with crusty bread and butter. And there you are. Immune boosting chicken soup which should work like magic, and if it doesn’t, at least it tastes lovely. Oh yummmm I love chicken soup do much, especially when my mum makes it. I like putting sweetcorn in mine. I love the photos with this, it looks wonderfully simple and full of goodies to make you better!